The commission covered the design and specification of rock slope remedial works at a 1400m length section of the white cliffs of Dover, to reduce the risk to the track and the potential requirement for speed restrictions in the event of failure. 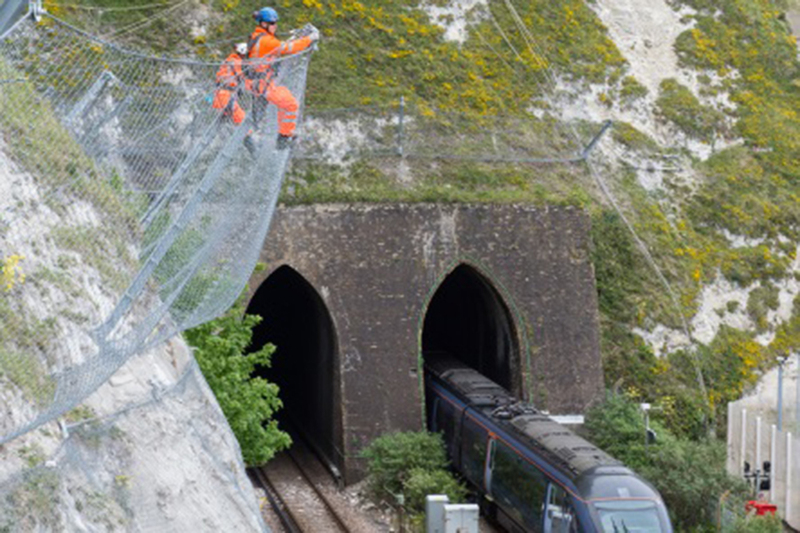 The site presented a number of challenges, with the cliff standing 120m high above the Charing Cross to Dover rail line, within a SSSI and adjacent to Eurotunnel infrastructure. The slopes were engineered at angles of 60 to 70 degrees during railway construction, but despite this, failures of various sizes have occurred. Geologists from Fairhurst’s geotechnical division carried out visual and tactile inspections of the cliff using rope access techniques to collect data on the position and size of potential failures. Together with cross sections derived from a detailed Lidar survey of the cliff, the data were input into specialist rockfall modelling software to simulate rockfall trajectories and the kinetic energy of falling blocks. The outputs allowed the required height and capacity of rockfall barriers to be established. Given the height of the slope, the potential failures recorded and the sensitivity of the railway, barriers developed in Alpine regions for rockfall and debris flows were specified. In discrete areas, on-face rockfall netting and dowels were designed to contain larger failures which could overcome the barriers. Following the completion of detailed design documentation, Fairhurst provided ongoing technical input during construction.